With the exception of Origen’s former bottom lane, most of the world still has yet to hear about a majority of the players in the 2016 EU LCS Summer Final — and if they have, given their deplorable showing at the 2016 Mid Season Invitational, it’s not for anything good. Despite winning All-LCS team jungler two splits in a row and MVP for the spring split, Kim “Trick” Gangyun only has 13,150 Twitter followers at the time I’ve started writing this, and Splyce’s best known member is their coach, Jakob “YamatoCannon” Mebdi. Only four players in total had played in a major league before this year. This year’s final also marks the first EU LCS final without a 2013 EU LCS Spring Split Fnatic member present. For this reason, I can almost guarantee the EU LCS’ viewership will be trumped by the NA LCS. This isn’t the usual decentralized viewership problem that Europe has, this will be merciless. The only viewers will be me, people who saw the G2 bad boys hype video and think the final is a continuation of them destroying other teams’ merchandise, and mid tier NA team owners scouting the EU LCS final in the hopes of spotting cheap upgrades for next year. Without enough familiar faces, the EU LCS might seem hard to market. Promo videos will be filled with shots of Jesper “Zven” Svenningsen and Alfonso “mithy” Aguirre Rodriguez. If it hasn’t been done already, the microphone will be shoved in Luka “PerkZ” Perković’s face prolifically in the hopes that he will say something controversial about Asian mid laners. But it doesn’t have to be forced. The rest of the world doesn’t know Splyce, an organization of young players that are either in their first year of LCS or coming from a 2015 that was filled with ugly results. If they know G2, it’s for vacation memes, a willingness to accept the villain label, or their world-calibre bottom lane. That’s the entire point. When October arrives, these teams can both imagine stepping off the plane into the slowly cooling city of San Francisco, checking into their hotels, praying the practice rooms have pristine internet connection, and laying in their beds, staring sleeplessly at the ceiling before the first day of group stage. No one will see them coming. For G2 Esports, at least, this is the last chance to gauge them, to feel disappointed or excited about the chances of Europe’s first qualified team. Depending on the results in Krakow, this may also be the last glimpse we have of Splyce. Pay attention, soak it in now, because when October arrives, you’ll want to remember how you felt watching the finals. If you do join the few, the proud, the watchers of the EU LCS final, know it will probably be disappointing for anyone expecting revolutionary advancement since last week’s semifinals. Splyce’s mid game indecision dragged them to five games against H2k-Gaming, and one has to wonder if they would have advanced if not for H2K’s obvious mental implosion — again. In a meta seemingly reliant on getting ahead early, Splyce averaged a deficit of 1,183 gold at 15 minutes in their semifinal series. H2K’s failure to push their lead gave Splyce openings, and appalling over-forcing in Game 5 made the final match a stomp. G2 Esports’ only decisive victory over the Unicorns of Love, the lowest place team from regular season to make the playoffs, was as a result of Trick camping Ki “Expect” Daehan’s lane to stop the bleeding while Perkz raised several questions when apparent lapses in judgment lead to failed attempted 1v5s. A lot of these same symptoms from both teams are likely to persist — but so will the highlights. Martin “Wunder” Hansen’s Gnar bullied Andrei “Odoamne” Pascu relentlessly, and he displayed some of the most spectacular outplays around Baron. Splyce may not have moved around the map decisively, but they made intelligent choices that will continue to build their confidence playing from behind and make them unique among the laning-centric heavyweights. The synergy in teamfights between Trick and Zven has become a treat to watch. 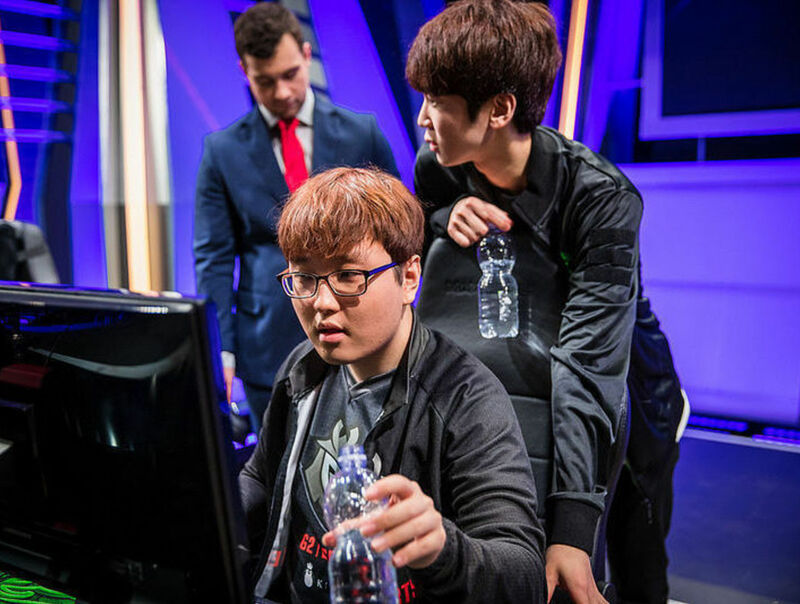 Trick continues to play spectacularly, both outfarming and outpressuring the map, reducing UoL’s Kang “Move” Minsu to a frantically pacing creep mob. Perkz’s apparent distraction based strategy is far from perfect, but interesting in its ability to pull pressure. Splyce’s match against G2 will be interesting because it is another matchup that will highlight the top lane, and G2 will once again dig deep for resources. As long as solo lanes can keep vision of the enemy jungler, G2’s bottom lane commanded the 2v2 on their own against the Unicorns. This may prove a steeper task against Kasper “Kobbe” Kobberup and Mihael “Mikyx” Mehle, who may not broadcast laning as their strong suit, but know how to keep themselves from falling behind too steeply. The EU LCS final will be exciting and full of close games, but it will be underwhelming — yet more for the cleanliness of the games than the storyline. It won’t have the baggage and the nostalgia of North America’s TSM vs. C9 final, true, but it’s starting over. All summer, spectators have expressed nothing short of disgust with Europe’s play as a combination of G2’s devastation at MSI and the growing pains of new heroes made themselves evident. No matter the outcome, at least G2 will go through the furnace of the Korean bootcamp and come out a different team. Regardless of how spectacularly this final ends, no one has high expectations for G2 after MSI, and Splyce are still green. No one will see them coming. And for better or worse, at the end of the year, everyone will know who they are.